Even the most naive tourist needs no explanation of how you get to Naples and Pozzuoli, but if you are traveling with a camper it is instead essential to plan ahead to find a campsite, as there are so few places in the area. We were satisfied with the Castagnaro Parking equipped area in Quarto town, in the hinterland of Pozzuoli (Via Vicinale del Castagnaro, No. 1), well known to many readers of Plein Air; It is fenced and secure and has about ninety places, set on two levels with grass, in a quiet and peaceful area. After a tiring but rewarding day of seeing the sights, it is just what you need, led with expertise that puts you at ease with the South and its strong contrasts. The price is 15 euros per day per equipment, electricity is available, and during the high season it is absolutely necessary to book. The owners offer guests brochures, maps, courtesy and helpfulness, as well as a full program of excursions to nearby Naples, as well as to more distant locations such as the Amalfi Coast and Caserta. It can be reached from the Highway A1 and taking the Naples bypass (Tangenziale di Napoli) till Exit 12 "Pozzuoli Via Campana", from where you continue in the direction of Quarto, but if you come from the coastal highway SS. 7 quarter, which descends from Lazio to Gaeta, Mondragone and Castelvolturno, you must exit in Quarto. From here, to explore the area independently, it is not difficult to get around by subway (from Pozzuoli, one train stop - 4 minutes) or the railroad Circumflegrea, whose Quarto Officina Station is about 500 metres from the campsite. In Naples, the train stops at Montesanto, which is really handy because it’s a few steps from via Toledo. That campsite, what a joy! For a long time now, I’ve always wished to visit Naples, but I gave up every time for the mass media and the usual platitudes. This time, reading the November issue of the magazine, I noticed the advertising of Castagnaro Parking of Pozzuoli who, after I contacted them by phone - just sent me the full details of the program of winter activities. Normally I travel alone, thinking that maybe my interests may not coincide with those of another crew, which could give rise to unpleasant situations like some gatherings forming during meetings and events. With this mind, I headed to the city of Mount Vesuvius: with a contagious joy I'm writing this on my return. 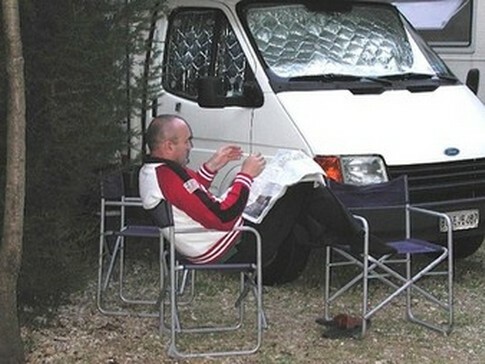 The Castagnaro Parking campsite has proven to be a welcome reality for the benefit of campers. The attention to guests from the moment you pass through the gates, efficiency, choice of qualified contractors (tour guides and drivers) allowed me to spend a very pleasant time there. And then this city with its sights, monuments, churches, the sunny disposition of the Neapolitans: in short, I’m a Genoese "happy to have spent some money" (because I got so much in return and is priceless). So, apart from the enthusiasm, concluding these lines I would like to make some general points. Firstly: the owner of Castagnaro, in the way she welcomes the guests, gives richness to the company. Secondly: she has set up a place that supports the campers and certainly does not drain them, while elsewhere we are often treated badly (Liguria on top). Thirdly: she does admirable work towards Naples and the Neapolitans: it is true that, thanks to many tour operators, the picture of Mount Vesuvius is in many European homes, overseas and Asian too, but in this case the reception is addressed especially to the Italians who, in these times of exaggerated patriotism, if hadn’t the chance to touch certain realities, perhaps would continue to discredit the beautiful Southern Italy. The initiatives of Castagnaro Parking are well known to the readers, but above all it must be said that the Neapolitan operator is one of the few equipped area managers (you really can count them on the fingers of one hand) who has been able to organize a complete service of tourist accommodation, offering to its guests not only a car, but a real opportunity to fully enjoy the surrounding nature. The effect? It is well described, in a few words, by the contagious joy of the Genoese reader.